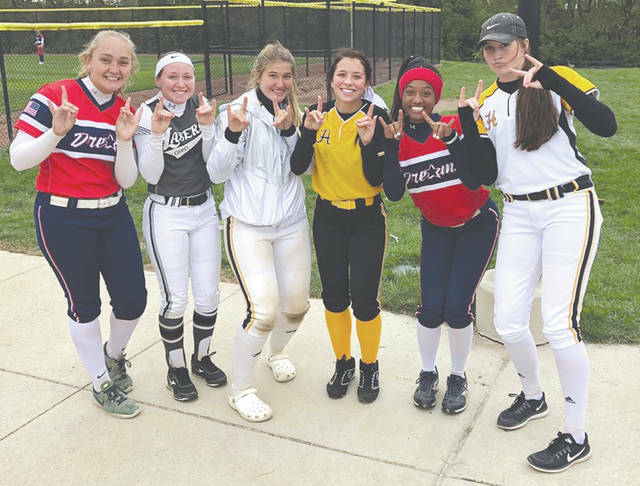 Wright State University’s 2019 recruiting class met up with each other at an amateur fast-pitch tournament earlier this year. Grace Gressley, Cameron Wesley, Olivia Bricker, Ernestine Hursey, Payton Baxter and Emily Daniel have signed national letters of intent to play for the Raiders next season. Photo courtesy of Wright State University. FAIRBORN — The Wright State University women’s softball program announced the signing of six recruits who will play for the Raiders next fall, WSU head coach Laura Matthews announced Nov. 15. Grace Gressley of Lebanon, Cameron Wesley of West Chester, Olivia Bricker of Cincinnati, Ernestine Hursey of Indianapolis, Payton Baxter of Indianapolis, and Emily Daniel of Marysville have signed national letters of intent with Wright State. Gressley, a 5-foot-8 catcher, has received numerous awards, including the Journal-News honorable mention in 2017 and first team in 2018 as well as second team by Cincinnati.com and first team by the Dayton Daily News, In her junior season, she collected 28 runs, 37 hits, six doubles and eight home runs with 42 RBI while hitting .468. Gressley hit two home runs with five RBI in the regional semifinal game. Wesley, a first baseman at Lakota West, was twice named to the second team all league and received the Firebird Award and NFCA All-American Scholar Athlete while her team was state runner-up in 2018. She hit .393 with a .443 on-base percentage in 29 games as a junior. Bricker, an outfielder at Clermont Northwestern, has played baseball much of her life before and currently is the only girl in Ohio that plays for the boys baseball team. She also plays for the Women’s National Baseball Development Program. Bricker also plays on a high-level girls’ traveling softball team and she’s captain of the girls’ high school basketball team. Hursey, an outfielder, has twice been named All Conference and All County as she hit .408 with four home runs, 35 runs, 29 hits and eight stolen bases, including a slugging percentage of .873. As a sophomore, she hit .403 with eight home runs and 31 hits. Baxter, a catcher from Decatur Central in Indianapolis, was named all-Marian County and all-league last year as she helped her team to the 4A State Championship, hitting .407. At the ASA Nationals, she caught 91 innings with 14 pick offs and two home runs. Daniel, an outfielder, was an honorable-mention All State players last year as well first team all-district and all-conference and second team All-Metro. Her .559 batting average set a new school record, tying the record for most hits with 47. She also collected 24 RBI, five homeruns, 15 stolen bases,nine doubles and 50 runs scored. As a junior, Danile hit .553 with 47 hits and 41 runs. Last season, the Raiders softball team finished with a 21-21 record, and was 12-10 in Horizon League play. WSU has maintained a regular season record of .500 or better for five consecutive years now. Wright State will open the 2019 season at the UAB Tournament, Feb. 8 in Birmingham, Ala.
https://www.xeniagazette.com/wp-content/uploads/sites/32/2018/11/web1_2019WSUClass_PS.jpgWright State University’s 2019 recruiting class met up with each other at an amateur fast-pitch tournament earlier this year. Grace Gressley, Cameron Wesley, Olivia Bricker, Ernestine Hursey, Payton Baxter and Emily Daniel have signed national letters of intent to play for the Raiders next season. Photo courtesy of Wright State University. For more information on Wright State University athletics, please visit wsuraiders.com .